You will be given a reference e-book to read which has 301 pages And the test will be based on that e-book , you can take final test within 1 year of purchase. What is meant by DOS? DOS or disk operating system,is a short form for numerous computer operating systemsthat are operated by using the command line. DOS is used to define the family of variousparallel command line systems, comprising of MS-DOS, DR-DOS, ROM-DOS, OSx16, Horizon OS, PC DOS, FreeDOS, and PTS-DOS.In spite of the common usage, none of these systems were purely named DOS, which was a name given only to an unrelated IBM processer operating system in the sixties. A number of isolated, non-x86 microcomputer disk operating systems consisted of DOS in their names, and are frequentlydenoted to merely as DOS when discussing about machines that use them, for instance: Apple DOS, Atari DOS, Commodore DOS, AmigaDOS, AMSDOS,ANDOS,,CSI-DOS, ProDOS, and TRSDOS. While providing many of the sameoperating system functions for their corresponding computer systems, programs successivelyrunning under any one of these operating systems may not run under others.The configuration of accessing hardware in DOS openly makes it perfect for use in embedded devices. The final versions of DR-DOS are still targeted at this market. DOS is a single-user, single tasking operating system with basic seed functions. Only one program at a time can use them and DOS itself has no functionality to permit more than one program to execute at a time. The DOS kernel offers numerous functions for programs such as an application program interface, like file management, memory management, character I/O, program loading and termination. The DOS online certification course by Brainmeasures is a comprehensive course which explains about DOS clearly. DOSarranges for the basic ability for shell scripting, through batch files with the filename extension .BAT. These are text files that can be produced in any text editor. They are implemented in the same technique as assembled programs, and run every line of the batch file as a command. Batch files can also make use of numerous internal commands, such as GOTO and restricteddeclarations. Basic arithmetic and GOSUB is sustained with the DR DOS COMMAND.COM as well as some with third-party shells like 4DOS,nevertheless, no actual form of programming is generallysupported.The operating system providesan application programming interface that permits development of character-based applications, but not for accessing most of the hardware, such as printers, mice or graphics cards. This made it necessaryfor programmers to use the hardware directly, generallycausing in each application having its own set of device driversfor each hardware bordering. Hardware manufacturers would release specifications to confirm that device drivers for popular applications were available.Brainmeasures is an ISO certified leading online certification company renowned for their online certifications and skill testing. After getting enrolled in this course, you would receive an E-book that would guide you for the online exam. Upon successful completion of the course, you would be awarded the certification by Brainmeasures. The average salary of a MS DOS professional is around $37,500- $40,000. Salaries may vary depending upon personal experience and qualifications of an individual. Begins with discussing all the Basics. Describes everything about the PC. What is life at the DOS prompt? Explains about the DOS shell. Discusses about the state of windows earlier. Discusses about DOS in Windows 95/98. Discusses all about PC hardware and all that it consists of and why! Discusses about the RAM and memory in olden times. Explains about the Video display and the computer screen. Describes about the keyboard and mouse along with the “Any” key. Explains about the printer and its usage in order to make the right impression. Discusses all the facts about Discs. Discusses about the basic software set up. Explains all about the software programs, its rules and gives more information on them. How to play with the Editor? Discusses about the Hard drive where you save all your stuff. Explains about file fitness and the stud you do with files. Discusses about all the lost and found files. How to rectify the problems in your computer, hard drive and protect your data. Guides you to get in touch with a DOS Guru. 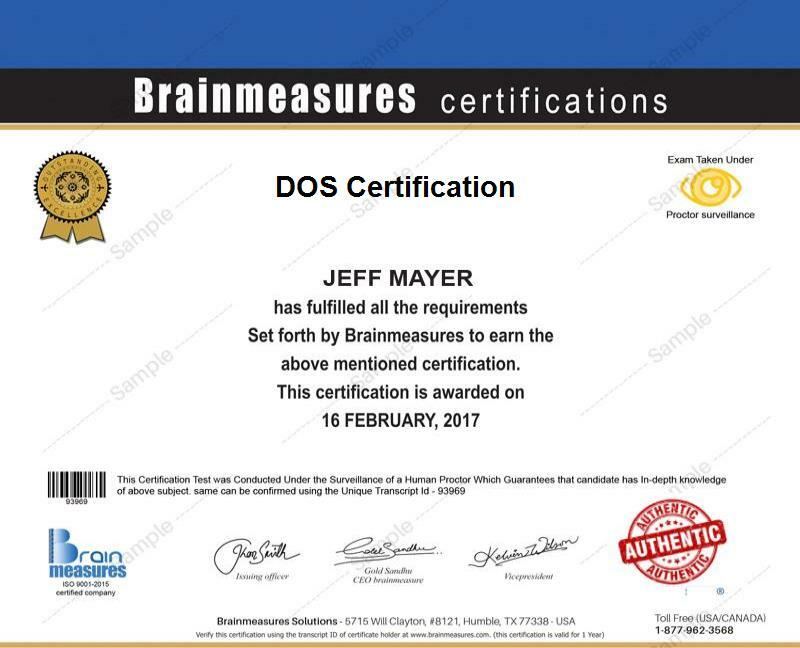 The DOS online certification course by Brainmeasures is really beneficial for programmers and information technology professionals. Individuals having a keen interest in computers and related jobs would be vastly benefitted by this online course. Most of the reputed organizations are looking for certified professionals in this field and as technology is progressing at a very fast pace, companies look for certified professionals to recruit in their company for maximum business profits and overall growth of their company. Certifications by Brainmeasures are recognized and accepted worldwide.